For one summer when I was twenty years old I stayed in the Ligurian countryside, in a village called Calvo close to the French border, with a family called the Lattas. Mamma Latta was an exceptional cook and I stole half her recipe book for my own personal benefit, but this recipe was not amongst them. This one belonged to her son, Fabrizio, who would come home from work on a Thursday evening and have less than an three quarters of an hour before going out cycling with his friends. Needing a shower, a quick food fix and energy before cycling, he would throw together this simple and exquisite pasta dish and have it on the table inside of fifteen minutes. It was so simple that to get the recipe all I had to do was watch him cook it a couple of times. The most complicated part was dealing with the tomatoes, but even that was simple once you knew what you were doing. Cut to eight years later and I pass the recipe onto our family biographer, for use on a Wednesday when he has a late lecture and only an hour before he has to leave for archery practice- Hence the name I gave it. Then it turns out that he doesn’t have lectures on a Wednesday so he has all the time in the world to cobble something up before half six. He’s still made use of it though, which makes me proud, and if I happen to be mooching round his place on a Monday (Monday has long been James’ designated Pasta night) he’ll make me some, or Macaroni Cheese if he has the right stuff. I prefer this though. This dish, every time I eat it never fails to remind me of that warm, Northern Italian, alpine scenery and always takes me back to that long, indulgent summer with Fabrizio and Mamma Latta and their family. Forget your smothered in sauce, non-Italian Macaroni cheeses and Spaghetti Bolognese, this is proper Italian style pasta, where you can taste every morsel and the flavour of the pasta comes through beautifully. The sauce (if you can call it that) is an accompaniment rather than an addition. Feel free to omit the garlic, but it does add an extra, nice note to the final result. You can also sprinkle with a bit of cheese (just a sprinkle, mind) if you really, really want. This is for a single serving. Following the ‘accidental’ death of her husband, the fifth Lady Beddgelert took to cookery. According to those she foisted her attempts upon, the results were often circumspect. One that was lauded, however, was her burger recipe. The story goes that when she first introduced it to her guests in 1895 one of the footman accidentally dropped one on the floor. Thinking nobody had noticed, he picked it up and returned it to the plate, at which point he was chastised by Lady Beddgelert. ‘In that case,’ my twice great grandmother Anna interrupted, ‘we should name it after Oscar Wilde!’ Cue much laughter around the dinner table, except for from my twice great grandfather who was of the opinion that Wilde was being unfairly persecuted. It was my great grandfather, himself an admirer of Wilde, who nabbed the recipe from the Beddgelert househould. It should be added that in his diaries my great grandfather wished to name his first born daughter after one of Wilde’s characters. Upon reaching a seventh son, however, he gave up on the idea of Lady Windermere Morfasson and settled for Earnest instead. The recipe is a bit vague, but it is really simple and should come out alright if you don’t overdo it with the amount of pork. Remember as well, you don’t want the burgers too thick or they won’t cook in the middle.
. In a bowl place the pork mince, flour, egg, puree and thyme and mix well.
. When mixed shape into rough, round patties, not too thick. You might get three or four depending on how big you want them. They may still be a bit sloppy thanks to the egg but this shouldn’t matter.
. Heat the olive oil in a frying pan and fry the patties on each side until browned and cooked through. If your burger has come a bit misshapen in the transfer to the pan you can still, quickly, round it off again with the edge of the spatula.
. Make sure NOT to move the patty around or jiggle the pan for several minutes, until the heat has knitted it together, or else it may become misshapen or fall apart and your hard work will have been for nothing. Just let it sit, let it cook, until you need to turn it over.
. Once cooked on each side transfer to the burger buns and serve, preferably with chips. *We hold no responsibility for this recipe going wrong, your bad cooking skills or any illness incurred by an attempt to recreate this recipe. 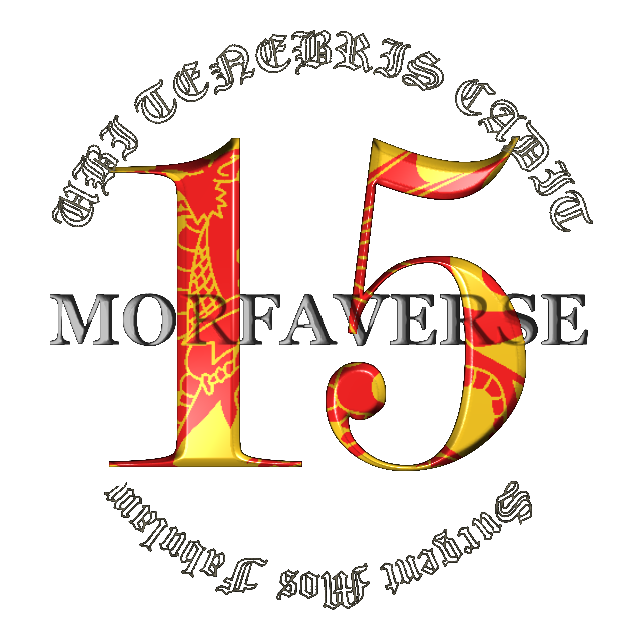 This November marks the fifteenth anniversary of the Morfvaerse, my own connected series of books, stories and other paraphernalia… But, just which member of the world famous Morfasson dynasty are you? Take the quiz below to find out!